Home / Posts Tagged "Cascia"
Columns Don't tell me he was Umbrian! Nicola Zabaglia, better known as Maestro Zabaglia, was born in Buda di Cascia, in Umbria, in 1664, although his tombstone bears the inscription «Romanus» and most of his biographers think that Tuscany was his birthplace. Thanks to the Carmelite Friars, his tombstone was placed in the Church of Santa Maria in Traspontina (Rome) and later removed. Son of Alessandro, master mason of the Fabbrica of St. Peter’s, in 1686 he started working in Rome at 22 baj and ½ by the day for Antonio Valeri, land agent of the Fabbrica of St. Peter’s. 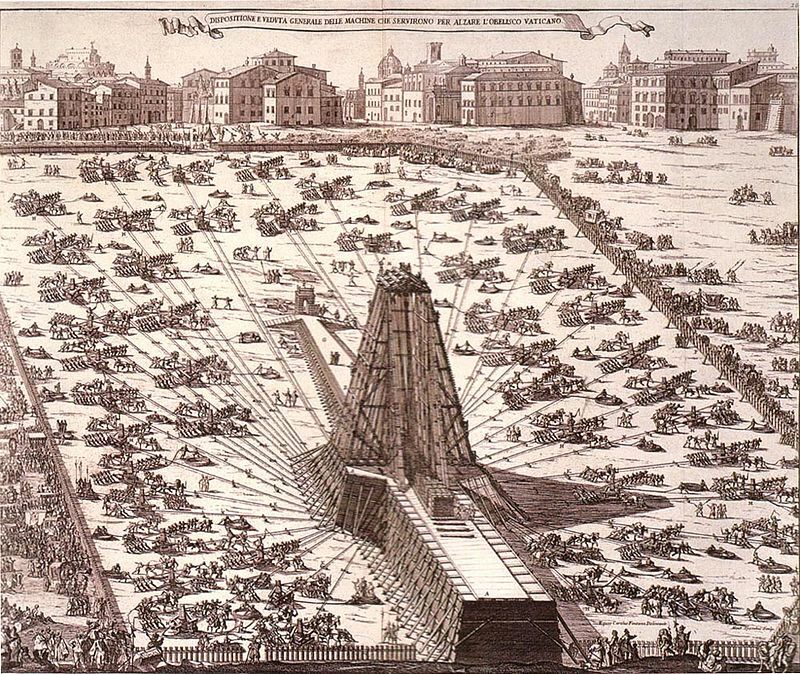 In 1703, for his skills and merits he was appointed as architect supervisor at the Fabbrica of St. Peter’s. «Without knowing how to read and without any teachers, he made so much progress in statics and mechanics and in the ability to lift weights that probably he was better than anyone else in the mechanical profession» and actually some of Zabaglia’s wooden models are still kept in the Petriano Museum, in Rome. The French scientist, Jean Etienne Montucla, in his Histoire des mathématiques has called him «a man of rare than of singular genius» and claimed that the collection of his inventions is «crucial to any architect in charge of major public works;»  this thought became widespread even after his death as evidenced by the publishing of a second edition of his work in 1824, which also included a biography of Zabaglia, to meet the several foreign requests. His works were very famous, although they were criticized by some of his contemporary architects such as Luigi Vanvitelli or Carlo Fontana. Perhaps they considered him as an unfair competitor because his machines were really cheap or maybe they didn’t think highly of him because he was almost completely illiterate; that’s why he didn’t take part in the technical-artistic debate on the consolidation of Michelangelo’s dome, but this didn’t keep him from constructing the scaffolding and the iron rims necessary to carry out the work. Marco Franceschini from Cascia, in one of his manuscripts describes him as a «boorish» (i.e. 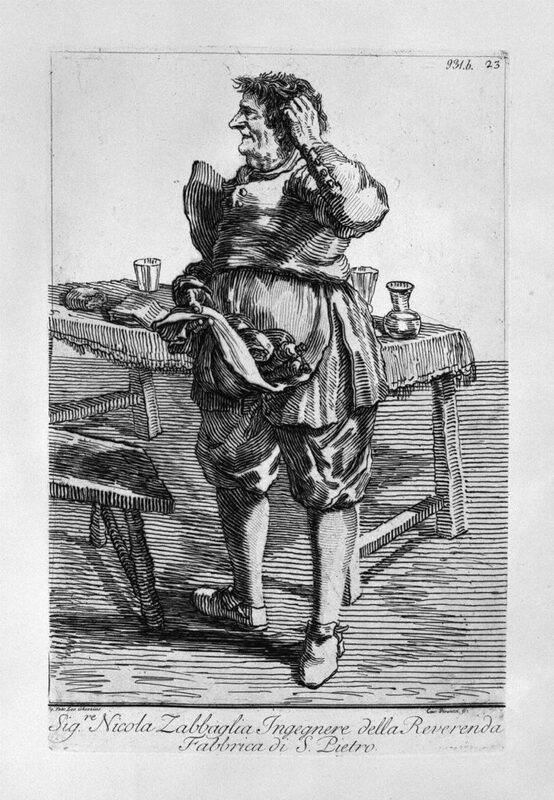 a rough person) who appeared before the King of France, Louis XIV «with a cap on his head and a cloth cape». When he saw him, he thought the pope made fun of him, but then «hearing that Zabaglia was ready to complete that work (turning a colossal statue) in one day only for payment of twelve bottles of wine», whereas so many good engineers needed one month at least, he had to change his mind looking at the work that Maestro Zabaglia had been able to complete  «in one day to great astonishment of all Paris… A street in the Testaccio district of Rome as well as a School of Arts and Crafts were named after Zabaglia». U.M. Milizia, Notizie sulla vita e sulle opere di Nicola Zabaglia, in http://digilander.libero.it/baraballo/umilizia/Zabaglia.html. 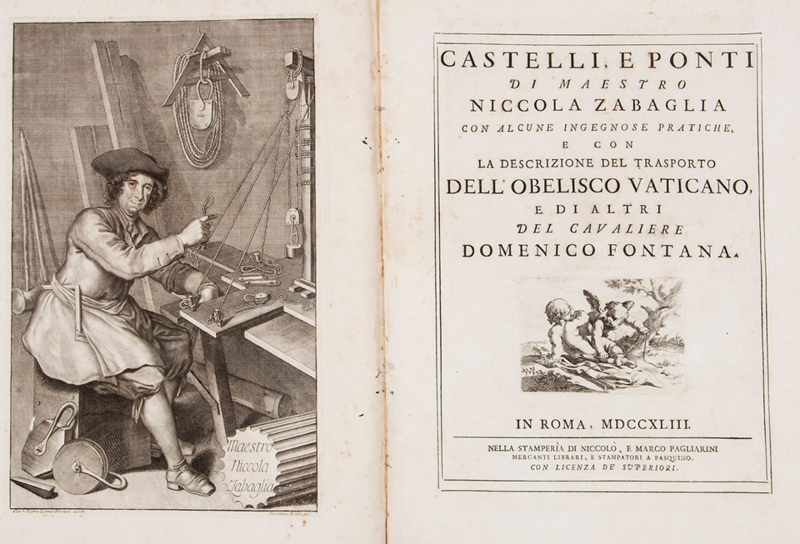 These are the words used by G. Bottari in the preface to N. Zabaglia, Castelli e Ponti di maestro Nicola Zabaglia con alcune ingegnose pratiche, e con la descrizione del trasporto dell’obelisco vaticano, e di altri del cavaliere Domenico Fontana, Roma, Niccolò e Marco Pagliarini, 1743. Quotation referred to by P. Pizzoni, Gli umbri nel campo delle scienze, Perugia, Urbani, 1955, p. 52. Quotation referred to by P. Pizzoni, cit., p. 52. For a detailed list of his works see http://digilander.libero.it/baraballo/umilizia/Zabaglia.html.